Stop a rattling ball mount, cargo carrier, bike rack or other hitch-mounted accessory with an anti-rattle hitch pin or lock from CURT. When towing, there is nothing more annoying than a ball mount shank that rattles in its receiver tube as you drive down the road. This rattling sound comes from a small amount of space between the receiver tube and the shank. If this gap is bad enough, it can even lead to sway in the load. A CURT anti-rattle pin eliminates the problem by securing it with a metal bracket and threaded bolt. 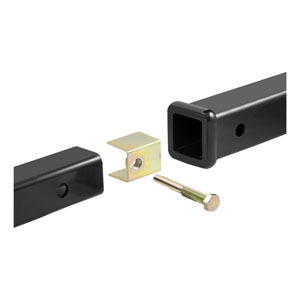 The anti-rattle bracket inserts into the ball mount shank and accepts the threaded bolt. Once tightened, the bolt and bracket assembly firmly hold the ball mount or hitch-mounted accessory in place and ensure rattling and swaying are no longer a problem. CURT offers anti-rattle hitch pins and anti-rattle lock for extra, key-operated security. They are made from steel to be strong enough to resist rattling noises even with large trailers, and they also feature a yellow zinc finish to resist corrosion. CURT anti-rattle ball mount kits are available in two sizes to fit ball mount shanks of 1 1/4"and 2". Anti-rattle kits are only compatible with hollow shanks. For any trip -- whether it is up to the lake for the day or from coast to coast -- CURT has the secret. Our anti-rattle hitch pins and locks make your towing experience more enjoyable no matter what you are hauling.